The Nadeshiko League (Division 2, Challenge League and Cup games) is back on MyCujoo this year again. Let us introduce you to the teams competing in Division 2 so you will get to know the best prospect players in Japan ! 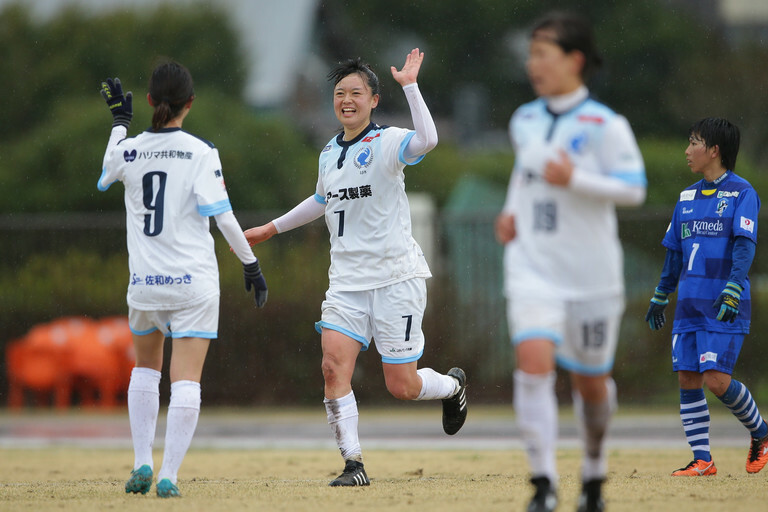 As the deep cold of winter melts away and the buds of spring arrive in Japan so too does another season of one of football’s leading female competitions – the Nadeshiko League. With roots that started way back in 1989 the league structure has blossomed from an initial six clubs to now boasting three elite tiers (Division 1, Division 2 & the Challenge League) as well as a highly competitive League Cup. Many of the stars that are expected to feature in Japan's push for a second World Cup title play domestically and both Division 1 & Division 2 are littered with current or former internationals that are set to light up both the league and cup. The third tier features some fallen giants, such as Okayama Yunogo Belle (fourth in Division 1 as recently as 2014), mixed in with some of Japanese football’s brightest young talents that turn out for the JFA Academy team as well as some newer clubs from Niigata and Hiroshima. Division 1 has some of the most storied sides in Japanese football, in the likes of INAC Kobe Leonessa and Urawa Reds, as well as a global powerhouse in 16-time champion Nippon TV Beleza and that should make the cup competition essential viewing on mycujoo. You can also catch all 90 regular season matches from the highly competitive Division 2 where Cerezo Osaka will look to bounce back from their relegation, Yamato Sylphid will aim to show that their promotion from the Challenge League was no fluke and fast-rising upstarts such as Orca Kamogawa bid to continue their meteoric rise through the ranks of Japanese football. Here’s a brief guide to the ten clubs that will provide some thrilling football in Division 2 – all of which can be followed exclusively live on mycujoo. From one of the powerhouse areas of women’s football in Saitama Prefecture, the club began life as a regional girls club before working their way up through the ranks and reaching the top flight in 2002. Since then they’ve been something of a yo-yo club having been promoted and then relegated three times over the past eight seasons with this their second season back in Division 2. Having finished third last year the club is eager for success with the new slogan of ‘Change 2019’ and have a mix of experienced former internationals in the likes of forward Eriko Arakawa and midfielder Kanako Ito and some promising younger players whilst the arrival of long-serving Japanese goalkeeper Miho Fukumoto also gives the team a steady presence at the back. The coastal city of Kamogawa is located on the southern tip of Chiba Prefecture and is home to a world-class aquarium where the club derives it’s ‘orca’ name from and just as the killer whale leaps through the air so too has the club set the clear goal of reaching the top division at the end of 2019. Having only been formed in 2014 it’s already been a meteoric rise, with promotion from the Challenge League coming at the first time of asking in 2016 and then being followed by successive fourth-placed finishes in Division 2. Having snared a major name in the off-season with the arrival of World Cup winning midfielder Yukari Kinga there’s plenty of experience in the squad and they are sure to be one of the favourites for the title. Taking their name from the Italian for 'challenge', the club from central Tokyo will be aiming to reach the top flight for the first time in their relatively short existence in 2019. With a huge base of talent to draw from, Sfida is the largest women’s club anywhere in Japan and boasts more than 180 players with deep connections to a range of local school sides. That connection with youth sees the club also as one of the youngest in the Nadeshiko League system and for the current season they’ll have only six players over the age of 23 as they look for that vibrancy and dynamism to bring them success. With their catchy slogan of 'forever evolving', the club from Yokohama will hope 2019 can see them go one better than last year after they finished second in the league but lost in the promotion/relegation match 4-3 on aggregate to fellow Yokohama club Nittaidai Fields. That last gasp failure hurt the club as the league’s top scorer, Ami Otaki, was snapped up by Division 1 side JEF Chiba but there’s still a core of experienced players to guide the team in the likes of defender Yuria Obara who arrives from top flight Niigata and midfielder Emi Yamamoto. Indeed, the club that has a connection to the men’s team of the same name is easily one of the more experienced in Japanese football, and they’ll be hoping that can see them take the next step in 2019. Having only risen from the regional ranks to the Challenge League back in 2015, this will be the first time in Division 2 for the club based ten kilometres to the west of Yokohama. Their unusual – and certainly not easy to pronounce – name derives from a Latin term meaning something like ‘Wind Fairy’ and it’s been a magical ride for the team that were until their entry into the professional ranks essentially just a development side for younger girls, but one that has produced a host of Japanese internationals. That tradition continues with current Japan U19 goalkeeper Momoko Tanaka on the books of a club that will likely lean on a core group of younger players to try and secure their place in the division. After three years down in the Challenge League, this is the second season back in Division 2 for the club from Shizuoka who at the end of their lengthy official name have tagged on the Spanish word for ‘beautiful’ and that’s at the core of the club’s mission to try and be a bridge from their hometown to the world. With close ties to the university that’s also a part of their name, ‘SSU’ are one of the younger teams in the division and they should be aiming to collect just enough points to maintain their place in the division in the face of some fairly stiff competition. One of the few clubs to be based outside of the greater Tokyo area, this will be the second season back in Division 2 for the team from the historic city of Kyoto. Since they moved to their current home base in 2006 they’re yet to reach the top flight and the club has set that as a target over the coming seasons as they look to build a team with deep roots in the community. With more than half a dozen new arrivals in the off-season there’s been more turnover at the club than most others but if those players, amongst whom former Japan youth international Maki Hiratsuka looks like a shrew acquisition, can gel quickly the club could be set for a successful campaign. One of two teams from the Cerezo club (the other is a youth side that plays in the Challenge League), the Osaka outfit will be aiming to bounce back to the top flight after they finished last and were relegated from Division 1 in 2018. That was the club's first time in the top division and they return to the second tier better prepared and understanding what it takes to be consistently competitive. The challenge, as always, though will be finding the experience they need across a long season given that this is also a developmental squad with not a single player over the age of 21 but given that they boast no fewer than seven current Japan youth internationals it’s certainly a squad with plenty of budding young talent. Another club whose name is a nod to mythology, in this case the ‘Albion’ from the club references an ancient Greek tale involving giants, and that’s the aim of the ambitious club from the castle town of Himeji who are looking to be amongst the leading teams in Japan. This will be the club’s sixth season in Division 2 and after having achieved their highest ever finish last year (fifth) the ‘Whites’ will be aiming to improve on that in 2018. Last year the team showed their defensive solidity in only conceding 19 goals in their 18 matches and it’s there where their greatest strength lies, so if they can find the goals to go with that a promotion push is a real possibility. The only club in the three tiers of Japanese women’s football to hail from the picturesque island of Shikoku this will be the eighth straight season for the regional outfit that is part of the same setup which has a men’s club also in the second division of the J.League. Boasting the third best defence in the league last season and a player in captain, Mana Akune, who finished near the top of the scoring charts they have quality at both ends of the pitch but will need to find a little more consistency to fight with the bigger clubs in the division.